Whether you’re a small start-up or a global brand, Shopify has a range of different packages to suit every type of business – and we’re here to help you choose the right one. The decision rests on the kind of functionalities you need. From selling a handful of products on your Facebook page to running a complex ecommerce store, each plan suits a specific purpose. You’ll also need to factor in things like your monthly revenue, how many staff accounts you’ll need and how much you’ll be paying in additional transaction fees. To make things simple, we’ve put together a handy comparison of the five different Shopify packages, including monthly plan costs, additional fees, a list of features, and a detailed overview into which businesses are best-suited to each plan. At $9 a month, Shopify Lite is the smallest Shopify package available – ideal for anyone looking to dip their toe into the ecommerce world. While it doesn’t come with an online store or shopping cart, Shopify Lite gives you the opportunity to sell on social media, in person or on your own website. The package also provides invoicing, along with access to Shopify’s POS app. If you’re looking to run a full ecommerce site, Shopify Lite isn’t for you. But if you’re a solo entrepreneur, or if you have a handful of products you’d like to sell, this package will help get you started. Think of Basic Shopify as your ecommerce starter pack. For $29 a month, you get a hosted website, a shopping cart, a blog, a POS app, and an unlimited amount of products and file storage. You also get access to Shopify’s fraud risk analysis tool, along with the ability to add discount codes to your store. However, you won’t have access to some of Shopify’s more sophisticated tools, such as professional reporting or clone stores. You also won’t be able to sell gift cards, which is essential for most ecommerce stores. Deciding whether the Basic package is right for you all comes down to your revenue. With Basic Shopify, you’ll be charged a 2.2% + 20p for every sale online, plus an additional 2% for orders placed through a third-party payment gateway (such as PayPal). These are the highest rates of any Shopify package (excluding Shopify Lite), and the more your revenue grows, the more you’ll pay in fees. If you’re a start-up with a couple of members of staff and a small revenue, the Basic Shopify package might be your best bet. But if you’re an established business that’s looking to scale, you’ll need a more sophisticated package. This is the most popular Shopify plan. Along with everything in the Basic Shopify package, you get the ability to sell and accept gift cards, access to professional reports and up to five separate staff accounts. You’ll also get discounted payment fees, with a 1.9% credit card rate + 20p and only a 1% charge on third-party gateways. Depending on your revenue, the money saved with these lower fees is often enough to offset the higher monthly plan fee. If you’re a small or medium-sized business, this could be the Shopify plan for you. However, if you’re a growing brand, you’ll be better off with one of the more advanced packages, which come with additional features and lower rates. This is a beefed up version of the core Shopify plan, with some handy additional features and smaller payment fees. As well as everything in the main Shopify package, you’ll get access to Shopify’s advanced report builder, which allows you to save filtered reports and create custom reports from scratch. Another benefit of the Advanced Shopify package is the third-party shipping calculations. This is ideal for anyone outsourcing their delivery, as Shopify will automatically calculate the shipping charge for you – allowing you to display accurate delivery costs to your customer. With the ability to add up to 15 staff accounts, the Advanced Shopify package is great for medium-sized businesses with a small team of people. And with 1.6% + 20p credit card rates and only a 0.5% charge for alternative payments, you’ll end up spending a lot less on fees. If you’re already a successful brand with a generous amount of orders, Shopify Plus is the platform for you. Designed for enterprises, it includes everything in the Shopify Advanced package, as well as 200 TB of storage, heavily discounted payment fees, unlimited staff accounts, and wholesale and B2B functionality. One of the biggest benefits of Shopify Plus is flexibility for selling globally. Every Shopify Plus account allows you to create up to 10 different clone stores, meaning you can create localised store views for different counties. Through Shopify Payments, you can also accept payments in multiple currencies, providing your international customers with a better shopping experience. 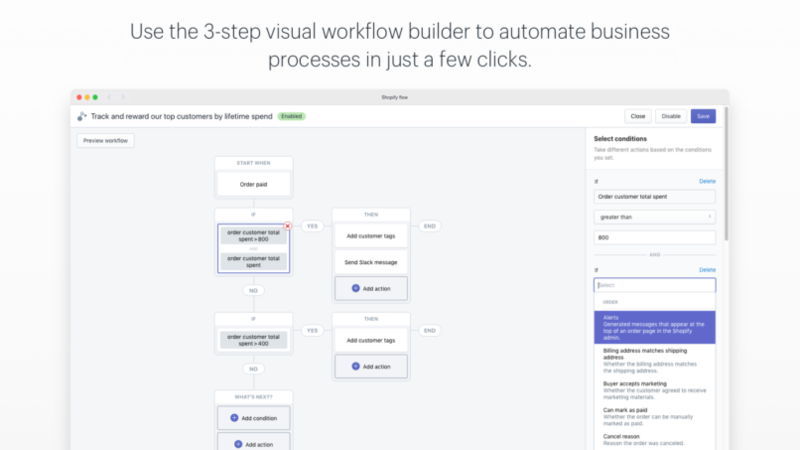 Another key feature is the Shopify Flow app. Available only to Shopify Plus clients, Shopify Flow is a free platform that lets you automate everyday tasks, such as product reorders and flagging high-risk orders. By tagging customers based on their purchase behaviour and notifying your customer service team of big orders, Shopify Flow also makes it easier to encourage repeat purchases. From targeted product recommendations to thank-you gifts for repeat customers, you’ll be able to use this customer data to personalise your marketing strategy. With the lowest payment fees of any Shopify plan, Shopify Plus can end up being cheaper than some of the other subscriptions – although this entirely depends on your yearly revenue. Automation tools, multicurrency and advanced reporting make Shopify Plus the best option for scaling your business. By freeing up resources and giving you access to customer insights, Shopify Plus enables you to provide an exceptional shopping experience. You can find out more about Shopify Plus here. Looking to grow your business with Shopify? Whether you’d like a brand new Shopify store, or you’d like to revamp your old one, we’re here to help. As one of the UK’s leading Shopify Plus agencies, we help growing brands to launch new integrated campaigns, drive new leads and make more money online. Get in touch today to find out more.